Another month goes by and some more updates, Woo Hoo. OK, nothing to ground breaking, but I get to cross one more off and more progress made on a few more. Me and heather like to serve at our church by volunteering on the production team. (It’s how we met each other in fact). So I figured it’d be good to help out a bit more. On Easter Sunday we went to a service at our old church. After the service, we walked around for a bit and stopped to talk to some old friends. 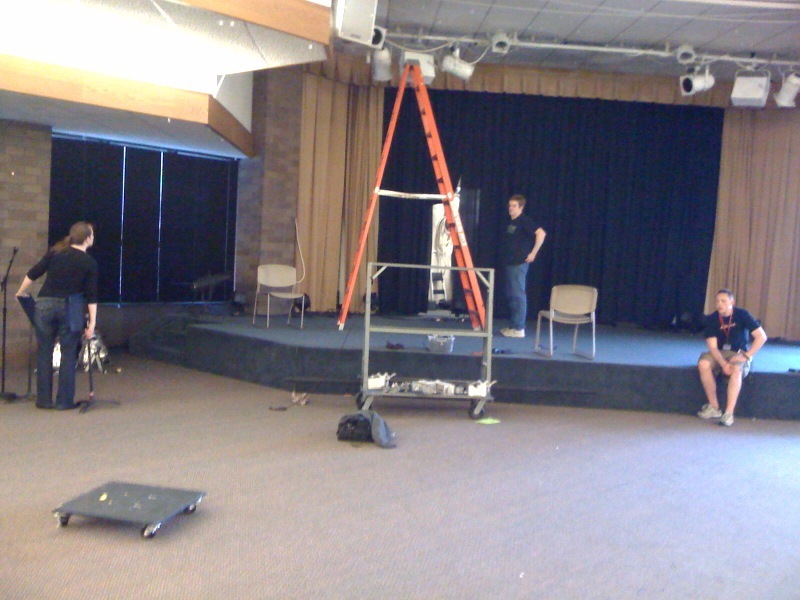 They had just finished working there for the day and had to tear down the stage in the room before they left. We decided to stay and help them out so they could get out of there a little sooner and spend time with their family. So a couple of hours later the work was done and everyone got to go enjoy the rest of their Easter. Hurray! 27. Play 1 board game from every shelf in the “library”. Ok, I forgot this one in my last update, but at a friends party we played a game of Apples to Apples. As party games go, it’s not bad. Its flexible depending on how many people you have and its pretty easy. However, I think I’m at the point with this game where I only want to play it now as a drinking game. 68. Read 2 new non-fiction books. For work, I have been doing a lot of ecommerce projects. One of them involved setting up a google adwords account for the company and running it. It has apparently matured since the last time I’ve used it so I felt a little behind in my knowledge of it. So I got a book called “The Ultimate Guide to Google Adwords, 2nd Edition.” A really informative book. I still have a good amount of learning to do on the project, but I feel a whole lot better about how it works now. The newest DVD to the every growing collection is one I’ve actually seen before. In college, we spent a lot of time watching the movie, The Big Lebowski. I don’t know why, but this movie just grew on me. So after finding out Heather had never seen it, I decided that she needed to. (even thought I knew she wouldn’t like it, women never do). So I traded for a copy from swaptree.com and we watched it one weekend. As predicted, I laughed a lot and Heather didn’t get it. Oh well, they can’t all be Breakin 2: Electric Boog-a-Loo. Well, that’s it for this month. See you on the next update!